"Kopi tau sa peah, take away!" I remember the way Lao Qian poured the coffee into an empty milk can. In my childhood, we used to take away the coffee by filling into the empty milk can. The coffee stain on the can and its lingering aroma are still fresh in my sweet memories even still today. My grandpa had been a coffee lover who insisted on Lao Qian's coffee. I wonder, its secret recipe might be the selected coffee bean? Or could it be the residue in the coffee filter? Ha Ha! As time flies, Lao Qian's Bakery is no longer there and so is its renowned coffee. However, the tastiness of its coffee has never faded away in my mind. So, How about replicating the coffee legend today? Countless hours of careful research has been carried out. A comprehensive programme is necessary to select the best coffee bean and to experiment on traditional roasting process. Days and nights, sweat and tears, but failure can't stop us from exploring secret of making the best coffee. And finally, we made it. With proud and sincere, San Shu Gong highly recommends the silky creamy Lao Qian White Coffee. Ingredients: Non-Dairy Creamer( Glucose Syrup, Sodium Caseinate, Hydrogenated Palm Oil, Stabilizer [E340], Emulsifier [E471], Anticaking Agent [E551]), Cane Sugar, Instant Roasted Coffee, Maltodextrin. 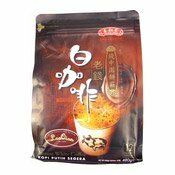 Simply enter your details below and we will send you an e-mail when “Instant White Coffee (Kopi Putih Segera) (白咖啡)” is back in stock!